Oh to paint where eagles fly and a billion stars fill the night sky. Come and enjoy a relaxing, inspiring, rejuvenating break at the Jonathan Art Centre. Our weekend painting holidays include delicious breakfasts, lunches and gourmet dinners, plus the chance to improve your painting skills with the help of expert tuition and guidance. Our 40-acre property is your home for the weekend. 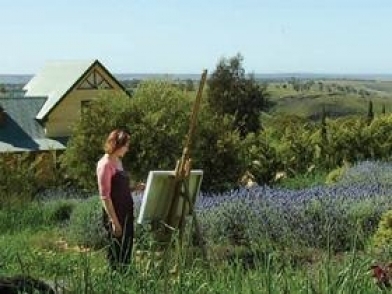 Feel free to roam and paint as you please or venture further out into the surrounding countryside. Come and chill out, learn or develop an absorbing pastime and enjoy the beautiful scenery. Courtesy transfers to The Jonathan Art Centre available from Mount Barker details on application.